Before I take off with Heidi on a ride round the island, I need to get a rearview mirror. I get up early head West along the coast to Los Charamicos, a small Dominican village along the highway. This is where I go for all my motorcycle needs. 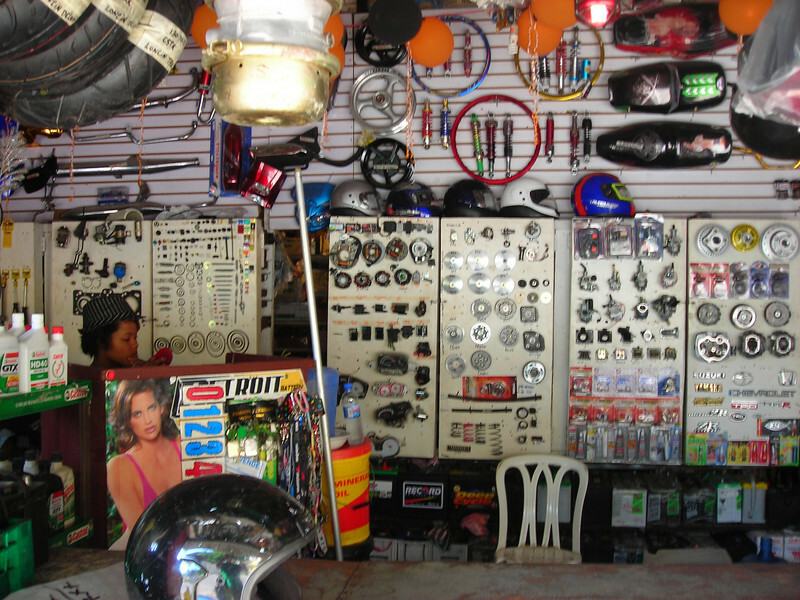 It is just a small parts store with a shop attached. If you don’t speak Spanish here you are out of luck. I look up the Spanish words for ‘rear view mirror’ before I head out. I write it down on paper in case I forget. And by just writing the words down is a great way for me to remember them. I start out with my most proper Spanish. “Good morning sir. How are you doing?” “I am looking for a rear view mirror for my motorcycle” I explain how I have no hole to mount the mirror and that I need a mirror with a universal mounting bracket to clamp to my handlebar.